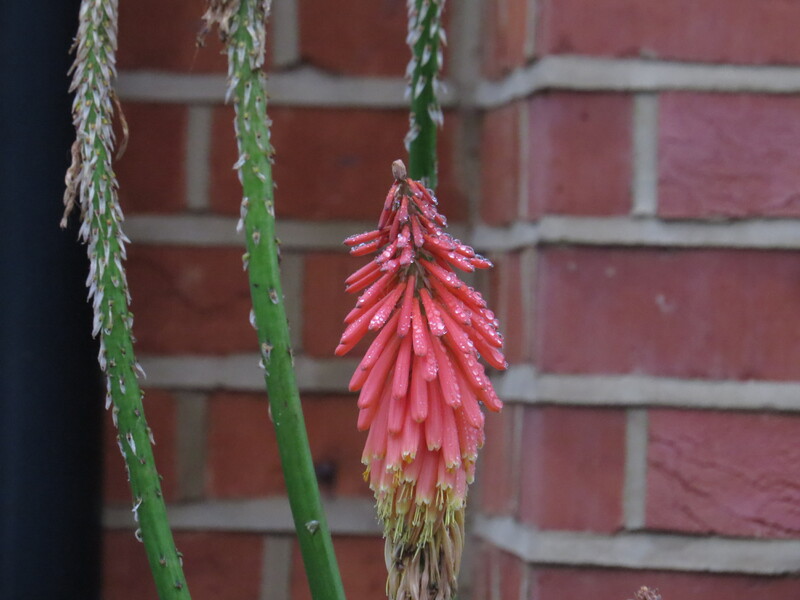 Dear Readers, this week I was delighted to spot this red-hot poker growing in a garden in Muswell Hill, and looking about as exotic as any plant has a right to do. I love the way that the orange colour complements the red brick wall of the rather splendid house behind it, and the way that the flowers were beaded with rain didn’t hurt either. 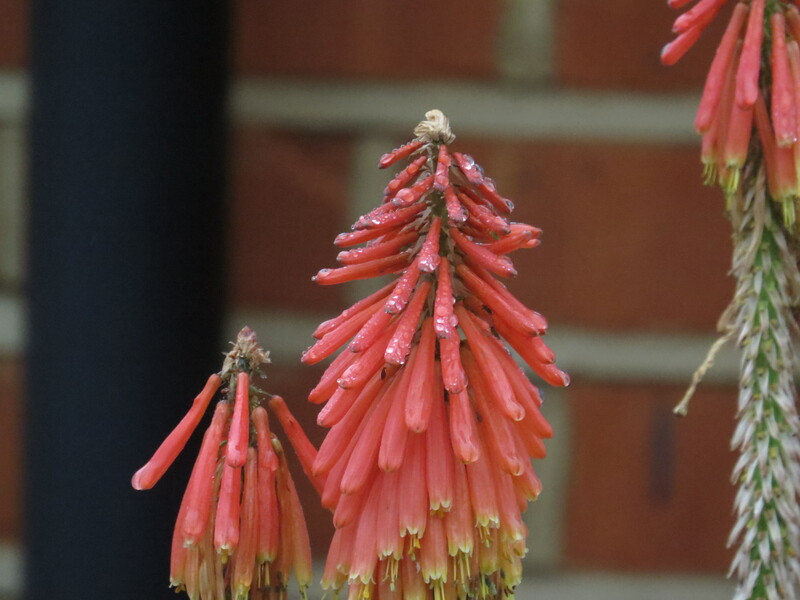 In its native South Africa, this plant is known as torch lily, and the flowerheads can reach up to five feet in height.Red-coloured flowers are often bird-pollinated, and in South Africa sunbirds are common visitors, but in the UK bumblebees also love the long trumpet-shaped flowers. 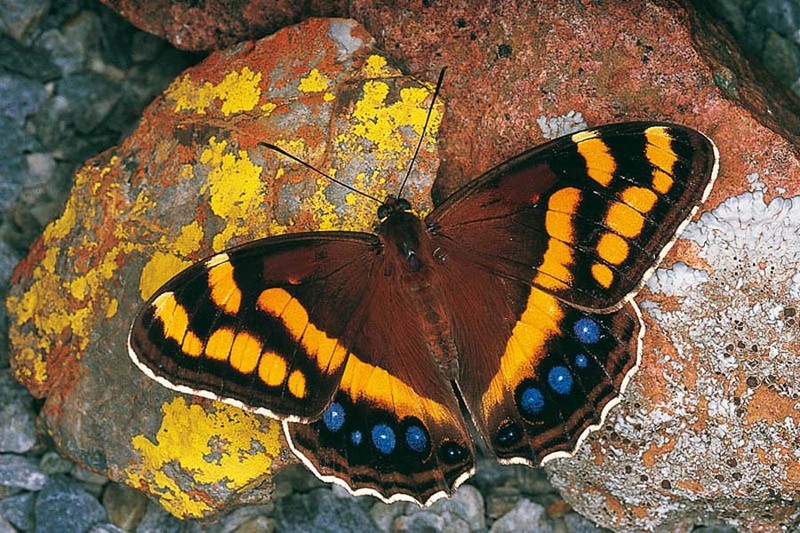 The Table Mountain Beauty butterfly (Aeropetes tulbaghia) also pollinates the flower, particularly in the Fynbos region of South Africa, and is unusual in preferring red flowers over the usual paler blooms. In his lovely blog ‘The Fynbos Guy’, the author mentions that wearing a red shirt will result in you being ‘buzzed’ by these beautiful insects. The plant has been introduced all over the world: in the New World, orioles and hummingbirds have taken a shine to it, and in Australia it has become something of an environmental hazard to the native wild plants. It is clump-forming and vigorous, and I can imagine how it could easily dominate in a fragile habitat. 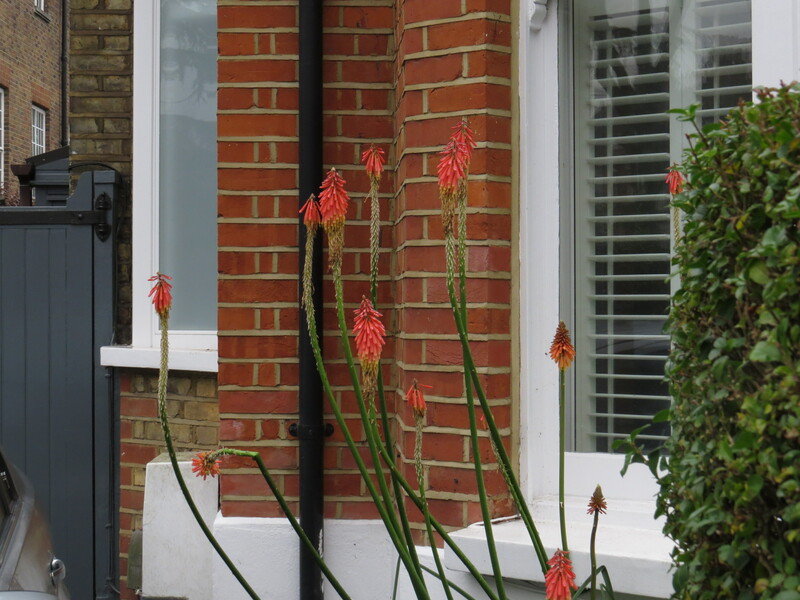 Red-hot pokers belong to the subfamily Asphodeloideae , which includes such plants as aloes and asphodels. There has been much debate about where exactly the plant belongs, however, and it is something of a puzzle. It certainly doesn’t share much of a superficial resemblance to its close relatives: it’s not a succulent, like the aloes, and it doesn’t have the flowers of the asphodels. What defines the subfamily is a chemical compound called anthraquinone, which is used in laxatives and in batteries. I suspect you’d have to be very careful to make sure you were taking the correct version of the compound. As you would expect for such a stunning plant, there are many cultivated varieties, in a range of colours. However, it’s the gradation of colour that gives the plant its common name, pale yellow at the bottom through to peachy-red at the top. The other colours don’t have the same effect, pretty as they are. I suspect that they may not have the same hardiness either: we’ve had snow and sub-zero temperatures for several days here in London, but the Muswell Hill plant is still going strong. 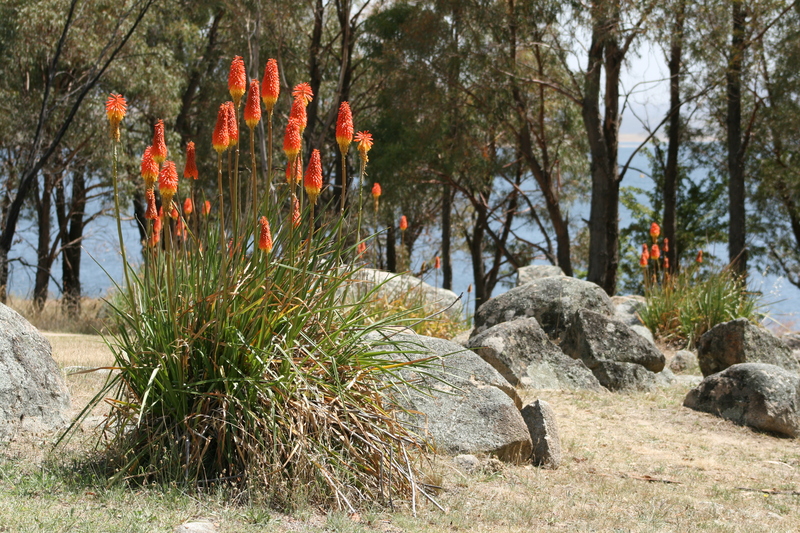 Once established, red-hot pokers have a reputation as being tough plants to kill, but an article in The Telegraph suggests that although Kniphofia was popular before the Second World War, many interesting varieties of red-hot poker were destroyed during the Dig For Victory campaign, when people dug up their flower gardens to grow food. It’s interesting to see that it is now back ‘in fashion’. By the way, the tricky Latin name Kniphofia is pronounced ‘Nee-FOF-ee-a’ and is named after Johann Hieronymous Kniphof, an 18th century German physicist and botanist. 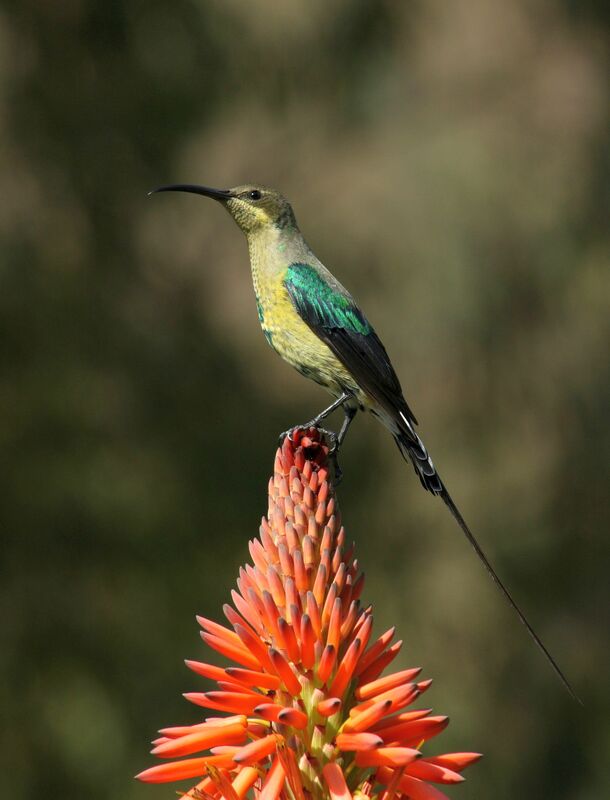 In South Africa the nectar-filled blooms are sometimes eaten by humans, and are said to taste like honey. 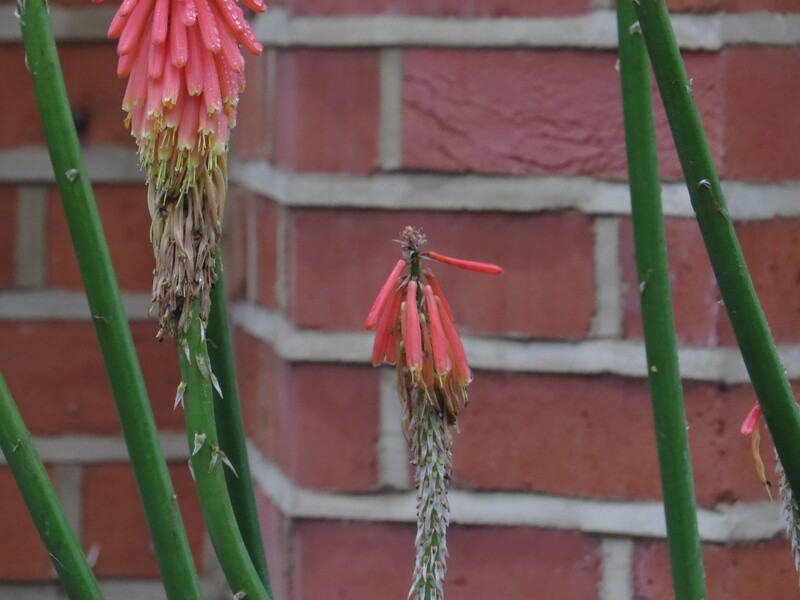 Medicinally, the flowers of some Kniphofia species have been used to repel snakes and an infusion of the roots has been used to treat chest disorders. 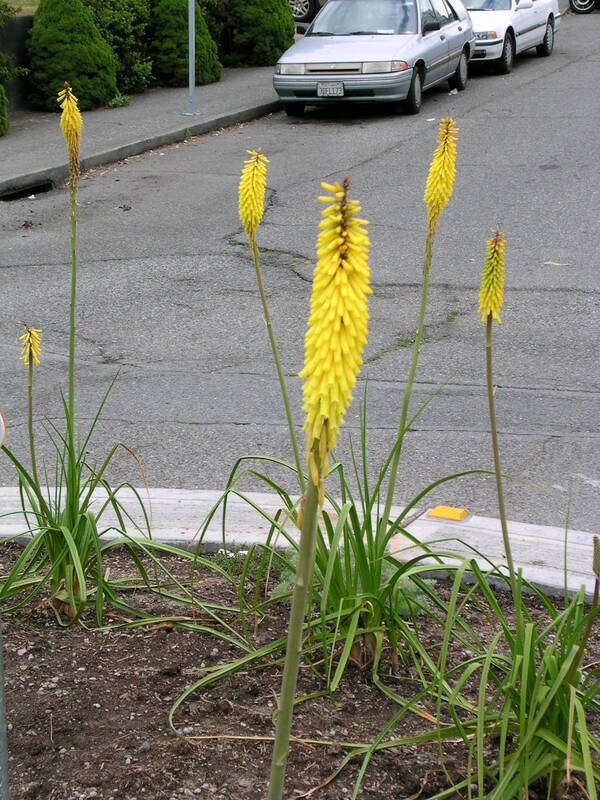 In Zimbabwe the powdered roots of Kniphofia are mixed with food to treat infertility in women. In Lesotho, the plant was considered to be a charm against lightning, and was therefore grown close to habitation. However, in the UK at least one person believes that they are unlucky according to the Plant Lore website, and according to Plant Lives, it’s believed that if red-hot poker flowers in the autumn it means a death in the family. Then again, my Mum believes that green is an unlucky colour, and my Nan believed that putting new shoes on the table would bring misfortune, so I guess there’s always something. It strikes me that superstitions grow from our fundamental need to explain either bad luck (in order to prevent it from happening again) or good luck (to make sure we get more of it). But this behaviour is not limited to humans. In some of his experiments, the behaviourist B.F Skinner provided pigeons with food that dropped out of a container at purely random intervals. He noted that the pigeons would repeat the behaviour that occurred when the food arrived in an attempt to get more. So, if a bird happened to be preening when a pellet dropped, it would preen obsessively to see if it could generate more food. Many other species of animal, from pigs to dogs to poor imprisoned primates, demonstrate the same tendencies. I wonder if this is the root of all religion: the need to find a reason for our mixed fortunes in a volatile, uncertain world. Now, as you know I like to finish my pieces with an artwork, or a poem, or preferably both, and this week my search has led me back to Les Murray (I featured his poem ‘The Cows on Killing Day’ in my piece on lucerne a few months ago). What a remarkable poet he is! As you know, I don’t cut and paste the complete poems of living authors, but here is a taste of ‘The Cowladder Stanzas’ from ‘New Selected Poems’. For the rest of it, you (and I ) will need to buy the book. to crash in pine tops for the cones. form rockets on a stick. Ignition’s mimed by yellow petticoats. And if this hasn’t whetted your appetite for more of this precise, explosive poetry, nothing will. This entry was posted in London Plants on December 6, 2017 by Bug Woman. Hey, ours bloomed too. I wrote about it not too long ago. It was a recycled article from last year at the same time. I was not sure that I should write about it because I thought that it was out of season. Hi Tony, things that bloom out of season are interesting in their own right though….I heard on the radio the other day that if a tree like a magnolia blooms in the autumn it probably means that it’s on the way out, and wants one last chance to reproduce before it dies. Plus the change in the climate is affecting everything in these parts – lots of interesting new insect pests, for example. Many plants bloom more when in decline, but Southern magnolia blooms whenever it wants to anyway. Deciduous magnolias blooming in autumn would be a problem, I suppose.